With four-screen EyeFinity, it's the ultimate 5770 for media centres. 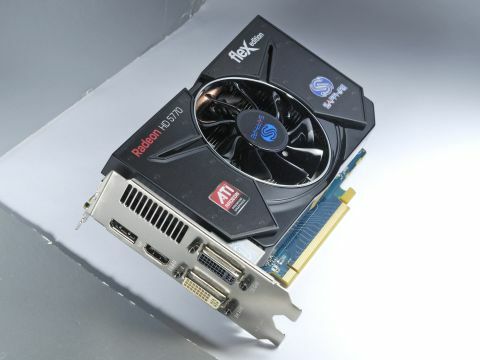 Sapphire's Flex Edition entry into the 5770 fray is as solid and competent as you'd expect from one of the key historical ATI partnerships. It's as roundly well-featured as any other 5770 out there, boasting HDMI, DisplayPort and two DVI-out ports, and the chunky aftermarket cooler is reassuring in its girth. It's USP, however, is that it supports four output monitors via EyeFinity, while most other 5770s only enable you to use three. That's a nice feature in itself, and if this interests you, you'll be pleased at the inclusion of a DVI-HDMI cable in the bundle. If you're after a massive piece of four-monitor real-estate to run your apps, or to spread video output around multiple screens throughout the house, then it's an interesting prospect. But that versatility doesn't stretch to multiple-screen gaming, as the benchmarks on the next page highlight.